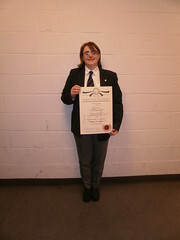 Congratulations to Lesley Cairns who was recently awarded her 5th Dan Black Belt. Lesley is the SKF’s treasurer and child protection officer. This entry was posted on Wednesday, April 11th, 2012 at 4:46 pm and is filed under SKF. You can follow any responses to this entry through the RSS 2.0 feed. Responses are currently closed, but you can trackback from your own site.